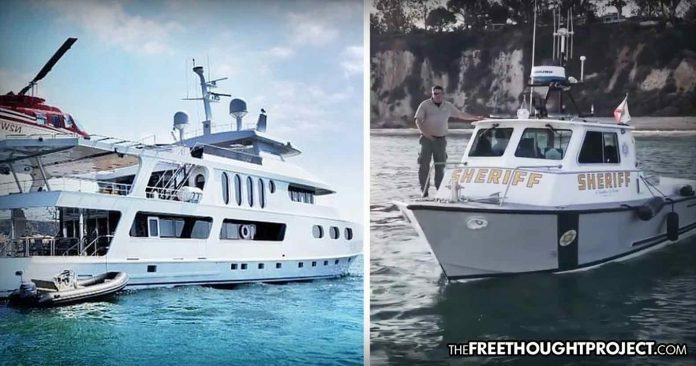 A billionaire vineyard owner decided to use his $25 million yacht to bring supplies to fire victims, but the police wouldn't let him ashore. Malibu, CA — Howard Leight, co-owner of the Malibu Rocky Oaks winery, is a billionaire hearing tech industry mogul who lost most of his vineyard over the last week as wildfires raged through California. His misfortune did not deter him from helping the victims of the fire, however. Last week, after Leight tried unsuccessfully to save his property from raging fire, he felt it was time to give back. So, he contacted his friend Bill Kerbox, and this week, they rolled in with the supplies. On Tuesday morning, a group of volunteers loaded up Leight’s yacht, named the Leight Star, with thousands of water bottles, 100 gallons of gasoline, snacks, dog food, lots of beer and other necessities. They then headed up the coast and began making their way to Paradise Cove. However, when the group of volunteers arrived at Paradise Cove, they were met by the LA County Sheriff’s department who refused to allow them on shore. “If we’re not letting people in by land, we’re not letting them in by sea,” an LA County sheriff’s deputy said. The boat was loaded with supplies, meant to help the local fire victims, and obviously had nothing but good intentions. However, the police had their orders and they stood by them—charitable ventures be damned. Even the small boats were not allowed to bring the supplies to shore. But this is California and they came up with a work around, and it involved surfers. Once the hashtag #malibuhope began trending on social media, word got out and volunteers flocked to the beach and began swimming the supplies to shore. Although it was not as fast as bringing the supplies ashore with boats, the surfers were successful and those in need were able to get the supplies they needed in spite of the ridiculous police demands. As TFTP reported this week, multiple fires have burned across California as hundreds of thousands of people have been forced from their homes and the death toll continues to rise. Authorities searching through the blackened aftermath of California’s deadliest wildfire Wednesday released the names of some 130 people who are unaccounted, including many in their 80s and 90s, and said dozens more could still be unaccounted for. Officials in Northern California said Tuesday that search crews had found six more bodies, bringing the death toll from the so-called Camp Fire to 56 and the statewide total to 59. As the devastation rages on, efforts like Leight’s are very important and show how private individuals can make a difference in times of tragedy. Hopefully, if anyone else wants to donate their time and money to helping those in need, they aren’t turned around by police and forced to use surf boards to deliver charity.